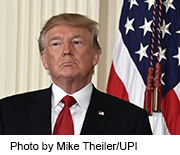 As a highlight of his 2019 State of the Union address, President Donald Trump on Tuesday announced his administration’s plan to rid the United States of new transmissions of HIV by 2030. “Together, we will defeat AIDS in America and beyond,” the president said. In a recent speech, U.S. Health and Human Services Secretary Alex Azar II described the project’s goals. If the plan succeeds, the United States will, “become a country where the spread of HIV has been effectively halted, because every American with HIV/AIDS is receiving treatment and every American at risk for HIV is engaged in the right, proven prevention strategy,” Azar said. One recent advance has been the emergence of drugs like Truvada, which are used for both treating active infection and as a “pre-exposure prophylaxis” (PrEP) — a preventive strategy for people deemed at high risk for infection. Communities deemed at high risk include gay and bisexual men, especially those of color, said Brian Mustanski. He directs the Institute for Sexual and Minority Health and Wellbeing at Northwestern University’s Feinberg School of Medicine in Chicago. Carl Schmid II is deputy executive director of the AIDS Institute, a public policy and advocacy organization. Speaking to The New York Times, he described the administration’s plan as “very bold” and said it “could be one of [Trump’s] greatest achievements,” if the president and Congress supply enough funds. The overall goal of stopping HIV’s spread by 2030 is achievable “if we increase testing, treatment and prevention,” Schmid said. There’s more on HIV/AIDS at amFAR.